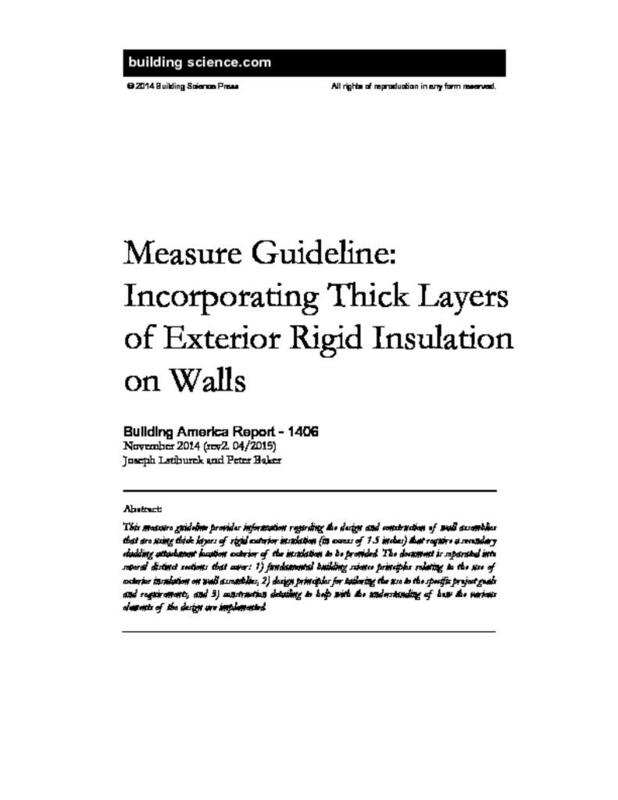 This measure guideline provides information regarding the design and construction of wall assemblies that are using thick layers of rigid exterior insulation (in excess of 1.5 inches) that require a secondary cladding attachment location exterior of the insulation to be provided. The document is separated into several distinct sections that cover: 1) fundamental building science principles relating to the use of exterior insulation on wall assemblies, 2) design principles for tailoring the use to the specific project goals and requirements, and 3) construction detailing to help with the understanding of how the various elements of the design are implemented. This measure guideline provides information about the design and construction of wall assemblies that use layers of rigid exterior insulation thicker than 1-½ in. The use of exterior insulation on wall assemblies is an effective strategy to address many common building enclosure energy and durability issues experienced in the industry. Insulation on the exterior of the structure can increase the overall thermal resistance of the assembly (beyond what is possible with cavity fill insulation) and provides increased condensation resistance in cold climates (Hutcheon 1964; Straube and Burnett 2005; Lstiburek 2007). The guideline is separated into several distinct sections that cover: (1) fundamental building science principles relating to the use of exterior insulation on wall assemblies; (2) design principles for tailoring this use to the specific project goals and requirements; and (3) construction detailing to increase understanding about implementing the various design elements. Designers, contractors, and building code officials will benefit from the information contained in the guide. The use of exterior rigid insulation on wall assemblies is becoming more common in the building industry, and is even part of the prescriptive requirements of the 2012 International Energy Conservation Code (IECC); however, a lack of information about effectively incorporating it in projects has prevented the widespread adoption of this energy reduction measure. Gaps in the building code that do not explicitly allow or provide guidance on the implementation create resistance for designers, builders, and building code officials who are responsible for the construction. This is not surprising, because improper detailing and construction can lead to water management and other building durability problems. It is important to understand the materials being used in the design and the detailing of how those materials are incorporated into the wall assemblies. This guide covers the use of rigid exterior insulation boards1 such as expanded polystyrene (EPS), extruded polystyrene (XPS), polyisocyanurate (PIC), and rigid mineral fiber (MF) as exterior insulation on wall assemblies. The guide also focuses on the use of layers of insulation thicker than 1-½ in. (exceeding the practical limit of directly attaching siding through the insulation back to the structure) that require a secondary cladding attachment location exterior to the insulation. The cladding attachment strategy is the use of wood furring strips attached back through the insulation to the structure. This approach provides an effective cladding attachment location when thick layers of exterior rigid insulation are used (Straube and Smegal 2009; Pettit 2009; Joyce 2009; Ueno 2010). Once the decision to incorporate exterior rigid insulation into the design of the wall assemblies has been made, the next decision is where to place the water control layer. This layer will most commonly be either in front of or behind the insulation. Either strategy can work, but we strongly recommend that a single strategy be used for the entire project to avoid confusion during construction. One of the most common issues noted during construction are reverse flashings or other holes resulting from inconsistencies in the locations of the water control layers. To help mitigate the confusion, the construction section of this document is split into two very similar parts. The first part contains details that have the water control layer in front of the insulation; the second section has the water control layer behind the insulation. For the most part, this measure will be used as part of a larger building project; thus, we strongly recommend that a design professional or a qualified contractor be retained. The options for constructing high thermal performance wall assemblies include exterior rigid insulation, double-stud walls, structural insulated panels, insulated concrete forms, and exterior insulation and finish systems. The decision about which assembly to use is complicated by weighing technical attributes, building durability risks, and cost implications (Straube and Smegal 2009). Of the many available variations on high performance wall assemblies, exterior rigid insulation provides a high thermal performance enclosure and many other benefits with respect to building durability (Lstiburek 2007; Straube and Smegal 2009). The decision to incorporate exterior rigid insulation on a building project depends on many factors. Fundamental to the measure is a desire to increase building thermal performance. Deciding on the project thermal performance goals is one of the first steps in the decision- making process. These goals are then compared to other factors to determine the viability of the measure. In most projects, the cost of the measure compared to the thermal performance is the primary consideration. However, other aspects such as code compliance, constructability, and in- service performance must also be considered. A markup per window for trim extensions that would be needed to account for the additional thickness of foam added to the exterior of the home. Other items such as house wrap or sheathing tape, self-adhered membrane flashings, metal flashings, siding, and siding fasteners should be omitted from the analysis because these items are associated with cladding and water management, and would be part of the project with or without exterior insulation. Depending on the results of this preliminary analysis, project costs may need to be cut in some areas to bring them in line with the budget. At this point, a more detailed cost-benefit analysis may be required to help determine the value of this measure compared to other aspects of the project. Value can be difficult to quantify because it is not simply a measure of cost, but can also include personal values, aesthetics, and other subjective measures. For some who are looking to design, build, or own low energy use buildings, the value of energy reduction may extend beyond simple economic payback. In these cases, the end performance may be worth the additional economic investment. Cost-optimized result. A cost-optimized result has the lowest combined present worth of the measure cost and the fuel cost over the analysis period. This is the most economical strategy and results in the best economic payback on the measure implemented. Cost-neutral result. A cost-neutral result is one where the combined present worth of the measure and the fuel cost is lower than the present worth of the fuel cost of the baseline building. This result does not necessarily see much economic payback, but does result in lower energy use and is a good metric for those intending to reduce energy use at no additional cost. The following analysis was completed as an illustrative example of a building retrofit. A benchmark house was chosen to provide a baseline for the analysis. The house was assumed to be single-family detached, two-story, slab-on-grade new construction. Table 1 lists the basic characteristics. The specifications of the home were based on guidance from the B10 Benchmark, as specified in the 2014 Building America House Simulation Protocols (Wilson et. al. 2014). Table 2 lists the enclosure specifications, derived from the 2009 IECC, which is referenced in the B10 Benchmark. To complete the evaluation, we looked at the incremental cost of adding several different thicknesses of insulation to the exteriors of the wall assemblies. PIC was used as the exterior insulation. Cost data for the exterior insulation were taken from RS Means Construction Data (Reed Construction Data 2011). Costs included the installed cost of the insulation material, 1 × 3 wood furring strips spaced at 16 in. o.c., and wood screws spaced at 24 in. o.c. vertically to attach the furring back to the structure. A cost markup of $100 per window in the reference model was used as an estimate of the additional cost for trim extensions that would be needed to account for the additional thickness of foam added to the exterior of the home. Simulations were run using Building Energy Optimization (BEopt™) simulation software, version 2.2.0.1, developed by the National Renewable Energy Laboratory. More specifically, the DOE-2 engine was used to run the simulations in BEopt. The wall conductance performance was isolated from all other aspects of the home to examine the cost effectiveness of this single strategy. For each parametric step the present worth of the measure cost (financed over a 5-year period at a 7% interest rate) and the cost of energy used (based on a 30-year period and a fuel escalation rate of 2%) was calculated. Table 3 illustrates the parametric steps that were run in the analysis. The reference case (parametric step R) is assumed to be fully sheathed 100% with oriented strand board (OSB). The percentage of OSB is reduced to 25% when exterior insulation is added to the wall system. This 25% is a result of installing OSB only where structurally necessary. The analysis was completed for various IECC climate zones ranging from 3A through 7A (see Table 4 for the associated reference cities). Appendix A provides detailed results of the analysis. In summary, in all climate zones, insulation thickness up to 1-½ in. (parametric step 2) was determined to be a cost-optimized solution. This was mainly due to an increase in the cost of the measure with the addition of wood furring strips and screw fasteners when exterior insulation 2 in. or thicker were used. Even with this increase, insulation thicknesses of 2–4 in. (parametric steps 3, 4, and 5) were still demonstrated to be cost neutral in all cities as part of this simplified analysis. The analysis focused on conductance improvements only; however, some argue that adding exterior insulation would likely also improve the overall airtightness of the assemblies (Ueno 2010). The benefits of increased airtightness are known to be very important in cold climate construction; however, isolating and apportioning these benefits to individual measures are also more difficult. When evaluating the potential for using exterior rigid insulation on a building project, all locally adopted code requirements must be met. Structural attachments to resist wind and gravity loads need to be considered and designed. Recent code change proposals have added prescriptive requirements tables to the International Residential Code (IRC) to allow for the use of wood furring strips over exterior rigid insulation as a cladding attachment location. These tables (which are new to the codes in the 2015 code cycle) provide guidance on the attachment of furring strips back to the structure to address wind withdrawal loads and gravity loads from the weight of the cladding. At the time of this writing these tables are likely not part of most locally adopted codes, but are included in Appendix B for reference. Fire safety is also an important consideration. Most exterior rigid insulation materials are considered foam plastics, which have specific code requirements for their use in buildings. Building type, location, and proximity to other structures may impact the fire rating requirements of the wall assemblies. Fire code requirements should be evaluated early in the design process to ensure that chosen assemblies are permissible. Most insulation manufacturers provide guidance on the use of their products in exterior wall assemblies, including a list of Underwriters Laboratories-approved assemblies that can be used in design. Finally, the IECC (2012) has added prescriptive requirements requiring the use of exterior rigid insulation for certain wall assemblies in certain climate zones. The need to use exterior rigid insulation may be a code requirement for the project and not just part of the project goals. The ease of implementing a measure can greatly impact the success of a project. Difficult details and construction sequences often lead to increased costs and performance loss. Efficiency in construction is driven by simple repeatable details and common construction practices. The more a measure deviates from common construction techniques, requires overly complicated sequences, or involves multiple trades, the more likely the work will not have the intended result. A key benefit to the use of exterior rigid insulation on wall assemblies is that it does not significantly change standard construction practices and details. The framing of the base building elements remains the same, with only slight modifications to interior and exterior trims. The only exception is where there is a wall above a roof. This is the most problematic detail during construction, because it requires a change in typical construction sequences that install roofing before covering the walls. This detail is not difficult to implement, but it does require preplanning to ensure that the correct elements are in place before the roof is installed. Performance Intrinsic to the measure is the use of wood (or other) structural furring strips. These furring strips hold the insulation to the wall and provide a structural attachment location for the cladding. In general, the furring strips are at least ¾-in. thick to provide sufficient material for the cladding fastener penetration. The gap that is created between the insulation and the cladding provides a significant water management benefit of drainage and back-ventilation of the cladding. Performance In cold climates, exterior rigid insulation reduces condensation problems in wood-framed walls. Traditional vapor control strategies try to limit the interior humid air that can come into contact with the exterior sheathing to reduce the condensation potential. Gaps in the interior air control layer (typically drywall) and vapor control layer (typically polyethylene or kraft-faced batts) can lead to condensation problems. Rigid insulation on the exterior of the wall assemblies keeps the exterior sheathing warmer and reduces the condensation potential. In fact, this benefit is recognized in the code, and sufficient exterior rigid insulation can allow the traditional interior vapor control layer to be eliminated. Rigid insulation on the exterior of the wall assembly greatly reduces the thermal bridging potential of the wall assembly. This allows the nominal insulation value to be very close to the in-service or “effective” thermal resistance value. By contrast, the thermal resistance of cavity fill insulation is reduced by the framing’s thermal bridging. For framed walls, the assembly’s effective thermal resistance can be at least 20% lower than the nominal value. A few risk factors are associated with the general design and performance of this measure. The measure is installed from the exterior. We recommend typical care and personal protective equipment for general building construction and fall protection. Working with exterior insulation products presents minimal health risks from skin contact, cutting, and grinding. In most cases, general skin, eye, or respiratory irritation results. General protective equipment, such as gloves and long-sleeve shirts, is recommended to avoid direct skin contact. In poorly ventilated areas, respiratory equipement may be warranted. In the event of a fire, toxic fumes are released from foam plastic insulation such as XPS, EPS, and PIC. The area should be cleared to avoid inhalation of fumes. Most durability risks are associated with design errors and construction defects if the measure is properly implemented. Poor flashing details present probably the most significant risk with this approach. However, this is true with almost all wall assemblies that are constructed with moisture-sensitive materials such as wood. Flashings at windows, doors, decks, balconies, roofs, and other penetrations are discussed in this guideline to help mitigate this concern. The second-largest risk is from improper structural attachment of the various elements. The load transfer path should be considered in the design for temporary and permanent installations. For this measure, the cladding is attached to the wood furring strip and not back to the structure. Therefore, the load transfer path is first to the furring and then from the furring through the insulation to the structure. The furring and the cladding need to be designed for their respective attachment locations and for the gravity and wind loading for their specific project requirements. For other elements, such as decks and balconies, the attachment back to the structure needs to be designed based on the expected loading. Some ideas for attachment are presented in this measure guideline; however, these should be used only with additional analysis to ensure adequacy for each project. The designer is responsible to ensure the adequacy of the building design . . . The use of closed-cell spray polyurethane foam is another exterior insulation strategy; however, it is not covered in this guideline.